All rooms in the hotel have a 3 star hotel rating and can all be comfortably reached via the lift. For breakfast we welcome you to our breakfast buffet. Extra bed and baby cot upon request (€ 8-20). All prices include the breakfast buffet. Bring your animal friend with you! If you are travelling with a pet, additional fees may apply. Free! WLAN hotspot is accessible in all areas and is free. Free! All children under 4 years old are free of charge for one of the existing beds. Up to two children under 2 years old are charged €8 per night per person for cots. One child under 12 years old is charged €13 per night per person for an extra bed. 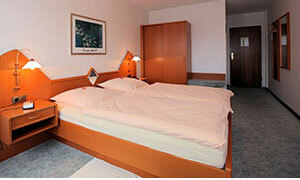 An older child or adult are charged €18 per night per person for an extra bed. The rooms have space for one extra bed or baby cot, maximum. Additional costs are not included in the total and must be paid separately during your stay.